This week, I have several new art dolls almost ready for images. The integral word here being almost. So, I thought that I’d share a few shots of one of last week’s pieces while she was still a work in progress. This is the image of my character from Japanese folklore, Otohime. She is quite different from most of the art doll figures I usually create. I constructed her primarily out of paper products. Her base is classic glue and newsprint paper maché over a chickenwire frame. The “watery” surface of the base I created through the application of layer upon layer of torn tissue paper. Her head, neck, and hands are sculpted out of paperclay with a painted and distressed surface. The base of the head and upper torso consist of a foil base covered with florist tape. One of the drawbacks of letting mixed media works take you where they want to go is that each can require reinvention of techniques. This can however be as enjoyable as it is vexing. I do like the discovery and puzzle solving involved in the process. It does require more time, and stopping as I work to decide where to go next with the piece. Even the elements that I more regularly incorporate into my art dolls required tweaking with this piece. For her kimono, had to fit the garment over an already posed figure, and carefully coat the underside of the garment with glue to resist fraying. In her right hand she holds a copper fan that had to be set and sculpted in place. The copper hands that I forge out of tubing and wire are able to be positioned to hold something added to them at a later time. I will be interested to see how this figure sculpture is received after she is displayed alongside my other art dolls in the gallery. This entry was posted in Uncategorized and tagged art doll, figure, figure sculpture, mixed media, one of a kind, OOAK, sculpture on September 25, 2015 by lynnadmin. It has been two weeks since I’ve shared a new art doll, so this post have two new sculptures for you. The first is Lacing II. As her name implies, she is a revisit to an earlier art doll. 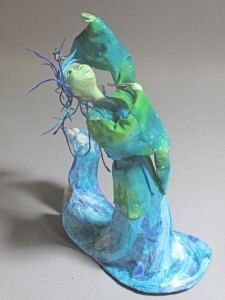 I have done a number of dancer art doll sculptures. They seem a natural subject area for doll figures. Lacing II is a seated figure in the middle of lacing up one of her toe shoes. With her copper face and hair, aluminum conduit arms, and faux leather elements of her skirt and shoes she evokes a steampunk aesthetic. I made the choice to fashion her hands, head, and shoulders out of paperclay. This media allows for much finer details for hands gripping laces, delicate ears, and neck musculature. I costumed Lacing II simply to give the impression she is getting ready for practice rather than a performance. The art doll Otohime, is another sculpture in my series of Fairytale and folktale characters. She is a figure from Japanese stories. I first encountered Otohime in Yuri’s Brush With Magic, a book by my mother-in-law, Maureen Crane Wartski. Otohime, is a water goddess, and daughter of the dragon Emperor of the Sea, Ryujin. In the tale of the fisherman Urashima Taro, Otohime appears a small turtle that the kind hearted fisherman saves from taunting children. Urashima is rewarded with a visit to the kingdom of the emperor, and the gift of a mysterious box that he must never open. My Otohime art doll is a mixed media combination of paperclay and paper maché. 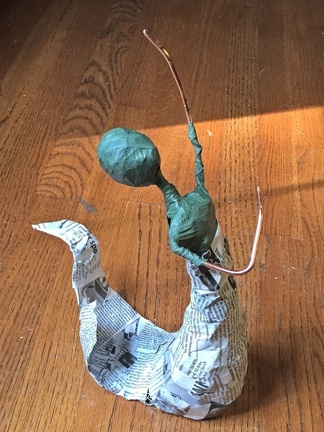 Her “water” under skirt and tail are papermache over a chickenwire frame, with color and texture created by layer tissue paper. 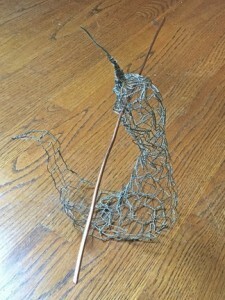 The figure’s head, upper body and hands are sculpted out of paperclay over a wire and foil armature. Otohime’s unique wigging is made of twisted and glued tissue paper. 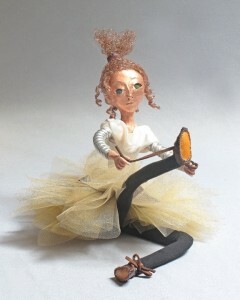 Elements from the metal studio serve only as embellishments as in the art doll’s torch enameled eyes, mesh collar, copper fan, and hair accessory. The kimono for Otohime is made from fabrics from the quilting collection that once belonged to Maureen as well. This entry was posted in Art Dolls and tagged art doll, ballet, copper, dancer, fairy tale, figure, figure sculpture, Japanese, mixed media, one of a kind, OOAK, sculpture, steampunk on September 12, 2015 by lynnadmin.